Vision Care Service (VCS) is an international relief organization dedicated to the prevention of blindness through our global projects and initiatives. VCS is a registered organization under the International Agency for Prevention of Blindness (IAPB), an affiliate of the World Health Organization (WHO). VCS works for the benefit of all people throughout the world who are suffering from vision problems, regardless of their race, color, creed, national origin or religion. VCS started in 2002 with its first “Vision Care Eye Camp” in Pakistan. 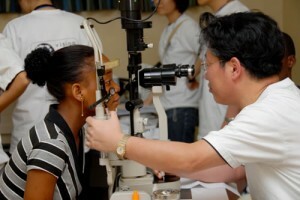 This very first eye camp was meant to be a one-time mission trip. 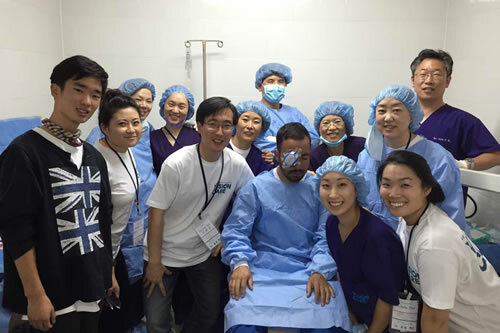 It was carried out by an all-volunteer team consisting of an ophthalmologist, a few nurses and optometrists from the Myungdong St. Mary’s Eye Clinic in Seoul, Korea. In just 15 short years, Vision Care Service has provided in excess of 120,000 treatments and performed more than 17,000 cataract surgeries through over 200 free eye camps in 35 countries. This is the equivalent of several hundred million dollars in treatments, surgeries and supplies directly provided by Vision Care Service on a fully volunteer basis, along with the help of individual participants and corporate donors. Mostly importantly, all of these volunteers and donors contributed with joy, compassion and love for our fellow men, women and children. 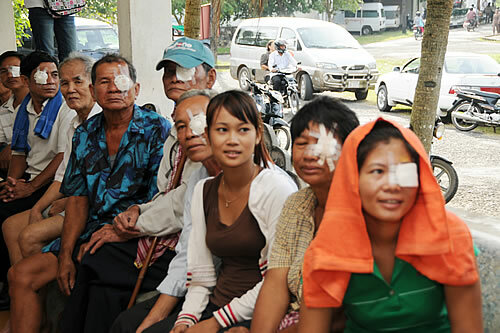 VCS has since conducted more than 25 free eye camps a year and has grown into an international non-profit organization serving 35 countries throughout Asia, Africa and Central-South America. In 2011, VCS West lunched at Los Angeles for focusing in Central and South America. As an international relief organization, there are several key aspects of VCS that deserve to be highlighted. First, we are a hands-on, action oriented organization. From the very beginning, we saw a global problem and simply decided to take individual action to solve that problem one patient at a time. VCS has now improved the sight and lives of over 17,000 people. Second, we are an all-volunteer organization, from planning to administration to execution. Each and every participant fully donates their time, skills and even pays their own travel and lodging expenses during an eye camp. Third, 100% of donations, whether in funds, equipment, supplies, time or talents, are used directly to carry out Vision Care Service’s vision and mission. Aug. 2011: Registered as a 501(c)3 nonprofit organization in U.S.A.